Eric Robson and the panel mark the 70th Anniversary of GQT in this very special edition, delving into the archives to revisit some of the finest moments in the programme's history. Eric Robson, Pippa Greenwood, Anne Swithinbank and Bob Flowerdew delve into the archives to celebrate GQT's 70th Birthday in this very special edition. As Gardeners' Question Time moves into its 8th decade, Eric and the panel revisit some of the finest moments in the programme's history. From humble beginnings with gardeners at the Broadoak Hotel, Ashton-under-lyne in April 1947, we hear how GQT grew to become a staple for amateur gardeners lasting 70 years. There's a visit to a nudist colony, a mash-up with The Archers, and questions from a young Esther Rantzen and John Humphries. Eric and the team examine the ebb and flow of horticultural trends and challenges throughout the programme's history - and announce the location for a special Anniversary Garden Party later this year. You can also find the first-ever episode of GQT from 1947 to listen to in full on the GQT pages of the BBC Radio 4 website. 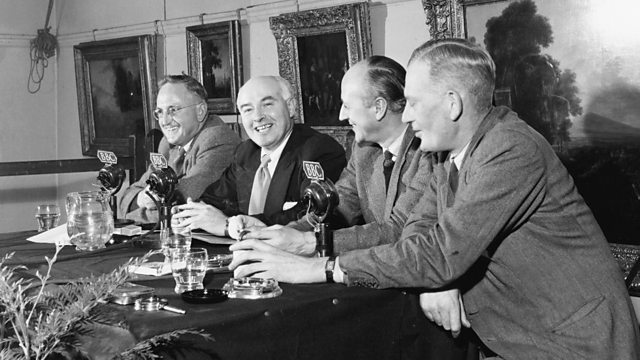 From 1947, the very first broadcast of Gardeners' Question Time chaired by Bob Stead. The acetates onto which the first episode of Gardeners' Question Time was recorded in April 1947. The plaque at the Broadoak Hotel in Ashton-under-Lyne, marks the site where the first 'Gardeners Question Time' was broadcast.